The Bluebird Electric, Europe’s fastest electric vehicle, is set to feature at the EcoVelocity festival on 8-11 September at Battesea Powerstation. EcoVelocity celebrates green motoring and the future of eco driving. The Bluebird Electric is a high performance electric supercar which holds the UK land speed record for electric vehicles, currently 137mph. Don Wales, the grandson of Sir Malcolm Campbell MBE, will be driving it at the EcoVelocity event. 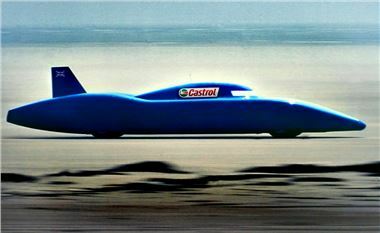 In 2012 Don will attempt the beat the world land speed record for electric vehicles in the car, with a top speed of more than 350mph in his sights. Don Wales said: “One day we’re going to run out of today’s fuels and electric is the future. I’ve felt strongly about this for over a decade and launched Bluebird Electric in the late 1990s. The first EcoVelocity show, with presentations on new technology and advice on cutting costs, will be held this year. Visitors will be able to drive low carbon cars around a specially designed track, see the latest green supercars up close, and even let the children try their hand behind the wheel, with two events designed for 6-11-and 11-15 year olds. If you’re interested in visiting EcoVelocity tickets are available at www.ecovelocity.co.uk, and for more information on the Bluebird Electric click here.